For perhaps the first time since the Iranian revolution in 1979, an Iranian composer living in Iran is collaborating with an American orchestra. It's the world premiere of "Kalileh," a classic Persian fable set to music by composer Hooshyar Khayam. And it's being performed Thursday and Friday by the Lake Superior Chamber Orchestra. In Duluth. 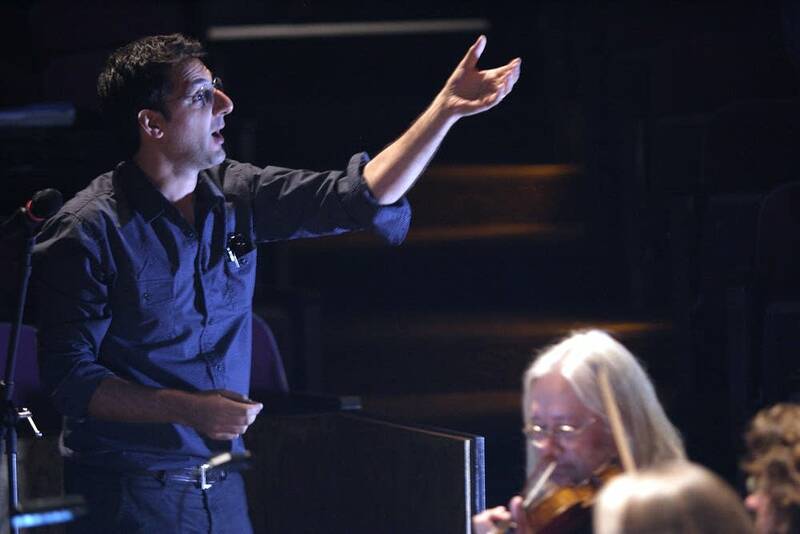 The story of how a small orchestra in Duluth commissioned an original piece from a young Iranian composer begins last year, when conductor and artistic director Warren Friesen needed six more minutes of music for a concert. "So I literally went into YouTube, and I put in 'piano and strings' and let's see what comes up," he recalled. Thousands of pieces did. And Friesen listened to snippets of dozens of them. "I came across a piece called 'Stained Glass' by a composer I'd never heard of, with this funny name of Hooshyar Khayam." "At this point I didn't even know that Hooshyar was living in Tehran. All I knew was that I liked his music." The LSCO performed the piece last July in Duluth, and an unlikely friendship was born between the 62-year-old Friesen and 36-year-old Khayam. "I was very much moved by the extreme power of the musicians in the American orchestra, who could in fact play the Persian rhythms with that accuracy and that perfection," Khayam said. So after that performance, Khayam agreed to write a piece specifically for the orchestra to play this year. The result is "Kalileh," based on an ancient Persian fable of the same name, which tells the story of a jackal, a trickster character, who seeks to become more powerful by becoming more beautiful. "I don't want to spoil it," said Friesen, "but it doesn't work out so well for him in the end." Khayam has collaborated with Friesen and others through Skype over the past year. He's in Duluth this week for the performances. He wrote the music for a chamber orchestra and a youth chorus. The lyrics, explained Friesen, are verses of poetry written by famous 13th-century Persian poets Saadi and Rumi. "The opening chorus, which I love, says 'Come, Come Wanderer, lover of leaving, even if you have broken your vow a thousand times, come, come.' It's such a beautiful invitation," Friesen said. Khayam said the work "for me was more than a professional commission. I personally believe that 'Kalileh' shows something deeper of this relation of me as an Iranian with this wonderful orchestra in America." Khayam was born in 1978, the year before the Islamic revolution in Iran. His father is a writer and his mother, a painter. For years, Iran's religious leaders frowned on public musical performances. So music went underground, said William Beeman, an Iran expert at the University of Minnesota who visited shortly after the revolution. "If you go through the Iranian newspapers, people were advertising in newspapers for musical instruction," he said. "People were continuing to get training in music ... that never stopped." Including for Hooshyar Khayam. By the time he was a teenager, music was being performed in the open again. University music programs sprang up in Tehran. Khayam said he's now part of a movement of young performers and composers who came of age after the revolution. "What we try to pursue is to try to find a common language which can be ideally appreciated and understood by Iranians and non-Iranians alike," he said. Khayam prefers not to discuss the tense political relationship between Iran and the United States. He wants to focus on his music, which he hopes transcends politics. "I am hopeful and am looking forward, as I have seen the artists here are looking forward, to a complete understanding and appreciation of each other's arts and culture," he said. At Thursday night's premiere, the youth chorus — kids from the Duluth area — were to end the performance by singing a verse in Farsi. Khayam said he would be closely watching the audience. The reaction, he said, would let him know if he'd succeeded in fostering, if only for an evening, a greater appreciation of the two cultures.